Click here for City Clean's service update e.g. the Tuesday date your next recycling collection! Visit the Facebook Page for Recycling & Refuse in Brighton & Hove. Waste and Water Reduction Supplement 2 inside including ideas towards working for a plastic-free Round Hill. See Planning Page: BHCC are locked into a 30-year contract with Veolia (i.e. into the 2030s!). Veolia are refusing to change the contract so that a wider range of plastics can be recycled. Caroline Lucas, MP for Brighton Pavilion, asks Michael Gove to look at the implications of such long contracts. It's great you recycle, but do you Recycle Right? 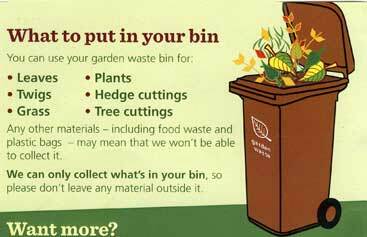 Sign up for garden waste collections for just £1 per week. Hot Bin Composters do the same very efficiently, but are quite pricey. Brighton Greencycle (Greencycle) started in January 2000, now with over 17,000 members) - we're here to help you give and get stuff for free - anything which could be reused. All items must be legal and appropriate, and free. No loans, swaps or sales please - just free gifts. I love freegle - this portal to the above site allows you to upload a picture of the item you are offering for free, which helps to attract takers. Emmaus Tel: 01273 426470 See also Brighton-specific website. This Community, based in Portslade, raises funds to help homeless people through the re-cycling of donated goods including furniture, household appliances, electrical goods (not gas), bric-a-brac, clothes, books, tools, toys etc. In fact, anything that could be of use to somebody, we will collect and if necessary refurbish and sell it on in our ‘Second-hand Superstore’ the largest second-hand shop in the South of England. Our shop also stocks a large selection of plants & shrubs grown in our nursery garden. 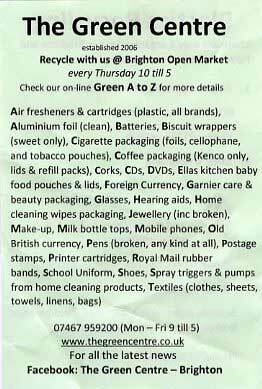 offers a wide range of recycling services to suit (almost) all needs. Magpie sells your unwanted funiture items: (Furniture donations: arrange collections on 01273 677577). Shabitat warehouserun by Magpie is open to the public 9-5 Mon to Fri and 10-4 Sat. Come and see our selection of furniture, electrical goods,computers, clothes and books and records. Places which take Electrical items working and not working. Computer Aid International - click here to donate computers & monitors. Furniture Now (Unit 1, Phoenix Works, North Street, Lewes, East Sussex BN7 2PE. Tel: 01273 487377). Phone first to arrange donations of furniture. Opening hours: 10.00am to 4.00pm, Monday to Friday. Our training centre in Lewes provides accredited training in refurbishing furniture to people with enduring mental health needs and other socially excluded groups. Through the scheme used furniture is transformed with decorative painting techniques such as marbling, stencilling and distressing, and then put back into use. Medicines and Medicine bottles will be accepted by any Boots Chemist store. The medicines are disposed of safely and the bottles are recycled into new bottles. Wood Recycling - Brighton and Hove Wood Recycling Project (Tel: 01273 570500) - we are now based at PRESTON BARRACKS, Lewes Road, Brighton BN1 4GL (open Monday - Saturday 9-5.30) and also have a showroom just off London Road, in ELDER PLACE, Brighton BN1 4GY. The Project provides a unique (and award-winning) site collection service. Instead of being discarded along with the general rubbish, all "waste" timber can be stacked separately for our collection. We guarantee to collect within 48 hours of notification (we know space is at a premium on most building sites!). On most occasions, we arrive the next day. "we are locked into a 30-year PFI contract with Veolia entered into in 2003. Veolia are refusing to change the contract so that a wider range of plastics can be recycled. The Council doesn't have the million pounds that it would apparently cost to put in the new machinery at the Veolia plant in order to enable a wider range of plastics to be recycled and therefore we are in a deadlock. Is that something I can encourage the leader of Brighton and Hove Council to write to you and..."
"Oh please do. And I'd be very happy to talk to Veolia about that." Articles relating to the above from Materials Recycling World [MRW] read by everyone in the recycling and waste management market to recycling officers in local authorities. Waste Watch Services (Keep Britain Tidy team) specialises in the delivery of waste and recycling community engagement campaigns, monitoring and evaluation and training for local authorities, waste contractors, and other public and private sector clients. Local authorities, including Brighton and Hove City Council, regard placing articles on pavements in the hope that they will find new owners as fly-tipping: a criminal offence which can carry an unlimited fine. See the RNIB's Who put that there campaign? Reporting not only deters dumping, but as the report goes to Cityclean it usually ensures that the offending items are fairly quickly collected. What is wrong with "Please Take" stacks? On "your own property" nothing at all, but "on public open space" (such as a pavement) Councils are compelled to regard this as fly-tipping, even if the stack is there just for a short time. the hope that items tidily stacked against a wall won't be scattered by cherry-pickers etc. Some residents regard "neighbourhood practice" as the example to follow. The problem here is that larger-scale flytippers, whose actions can trash a street scene and endanger pedestrians, may be led by the same example. If neighbours don't do it, it becomes easy to identify and stop the industrial flytippers. There is a lot on the news at the moment about illegal tipping on an horrendous scale. The more we can do to discourage it - and to persuade minor players not to take their lead from inconsiderate examples - the more pleasant our streets will look.